The Massachusetts Board of Elementary and Secondary Education voted to adopt a hybrid MCAS-PARCC test on Tuesday. MALDEN — The state Board of Elementary and Secondary Education, capping a contentious debate, voted Tuesday to develop a version of the MCAS test that will incorporate elements of a proposed replacement, known as PARCC. But Massachusetts families and educators now face another year and a half of uncertainty as they wait to see what the hybrid version of the two tests looks like. Linda Noonan, executive director of the Massachusetts Business Alliance for Education, said she hopes the test will be built largely on the PARCC, which the alliance believes is a better measure of students’ ability to process information and draw conclusions. Tuesday’s decision, Noonan said after the vote, extends a five-year period in which education officials have been trying to decide on the next benchmark to assess student achievement. “I’m like everybody else: trying to figure out what this all means,” she said. Barbara Madeloni, president of the Massachusetts Teachers Association, which opposes the PARCC, said the new test will really be the PARCC by another name. Are you smarter than a Massachusetts 8th grader? Try out a couple of these sample PARCC and MCAS question to find out. The 8-3 vote in favor of the “next-generation MCAS,” proposed by Education Commissioner Mitchell D. Chester, sets in motion Massachusetts’ first overhaul of standardized testing in nearly two decades. Districts that gave PARCC a trial run this spring would do so again for 2016, and districts that chose to stick with the Massachusetts Comprehensive Assessment System would continue to use it unless they opt to switch to PARCC, the Partnership for Assessment of Readiness for College and Careers. Massachusetts must begin administering the new test in spring 2017 to comply with a federal law that requires states to use a single standardized test, said board Chairman Paul Sagan. 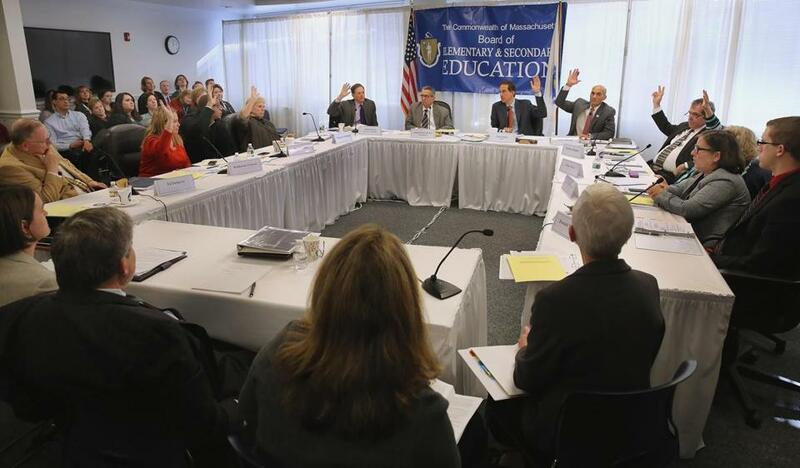 The state had obtained a two-year waiver to the law so it could try out PARCC before the vote. The PARCC aims to examine how students arrived at their answers and to require more critical thinking skills than the MCAS, state officials say. It is aligned with the Common Core standards adopted by the state in 2010. As was the case with the old MCAS, students will have to pass the hybrid assessment to graduate. The existing MCAS would remain the graduation standard through the class of 2019, which would take the old test as 10th graders in 2017 and would be able to retake it if necessary. Schools and districts cannot be classified as underperforming based upon their scores on the new test until 2018, under an amendment to Chester’s recommendation that passed by a 7-4 vote after considerable debate. Board member Margaret McKenna, who proposed the amendment, said she supported a hybrid test but thought that rushing to offer it in a year and a half did not leave proper time for development, beta testing, and setting standards. “I don’t think you can do it by 2017 and do it well, and I don’t think it’s fair to people to suggest we can,” McKenna, president of Suffolk University, said before proposing the amendment. Board members Ed Doherty, Mary Ann Stewart, and Donald Willyard voted against the hybrid test. Before the vote, Doherty said that after attending five of six public hearings on the tests, he was not convinced that either was superior, and he could not support a change. “I’m opposed to abandoning MCAS and going through the upheaval and the expense of going to a new test when we have a test that’s been serving us very well,” said Doherty, special assistant to the president of the American Federation of Teachers Massachusetts. Willyard, a senior at Everett’s Pioneer Charter School of Science and the board’s student member, said he could not vote in favor of embracing elements of the PARCC, a test that he said students do not support. James A. Peyser, the state’s secretary of education, voted in favor of developing a hybrid test. He told reporters that combining elements of both assessments is best for students. Chester said that the state will now seek bids from test developers and convene several committees of educators and testing specialists to advise developers on content and test policies. Under his recommendation, Massachusetts will remain active in the consortium of states that developed PARCC, giving educators access to future research and test items. The MTA’s Madeloni, citing Chester’s role as chairman of the consortium’s governing board, said remaining in the consortium is another sign that the state has actually adopted the PARCC while calling it MCAS.